Martial Arts School Vernon Hills: Why Sign Your Kids Up For Classes? Putting Athletes on Olympic Teams Since 1992. 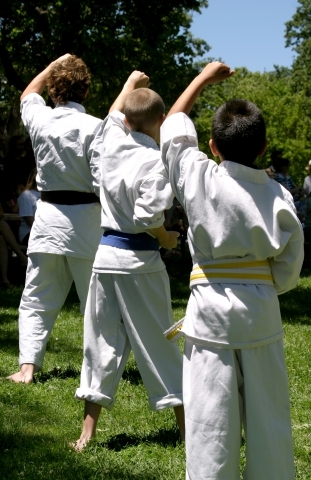 Why Sign Your Kids Up For Martial Arts Training? We’re proud to be one of the most successful martial arts schools in Vernon Hills. We believe it’s our family’s long legacy of participation in the martial arts, as well as a genuine love for our students of all ages, that has helped us to remain a trusted member of this community. Kids today have so many extra curricular activities vying for their time. You may have options to join sports teams, academic clubs, and artistic classes already on your schedule. So why sign up for classes at our martial arts school? Below are just a few of the benefits we feel your family will enjoy as students at Cohen Brothers Training Centers. We hope that after reading them, you’ll contact us to learn more about how to register for martial arts lessons! Increased Physical Activity – Childhood obesity is on the rise and digital technology has a large part to play in the cause. Children sit at school all day, sit in the car or bus on the way home, then immediately seat themselves in front of a screened device for the remainder of the evening. This sedentary lifestyle has a marked negative impact on their health. Martial arts classes provide at least an hour of every day in which they’ll be getting a cardiovascular workout and building strong muscles. Increased Ability To Focus & Be Still – One well known benefit of exercise is that it helps us to remain more focused during the parts of the day when we have to be still. With no distractions at our martial arts academy, your child will be focused on just one task while they’re here, and that will improve their attention span and discipline in other areas of life. We hope you’ll give Cohen Brothers Training Centers to be that martial arts school for your child. We’ve helped many different children (and adults too!) experience all of these benefits and more through martial arts classes. Contact us online or visit our Vernon Hills martial arts academy in person today!